Your dog loves to be part of the action, even if it means being dressed up as a pirate or ballerina for Halloween. However you dress your dog, please keep in mind his desire to please you, so no laughing! (At least out loud.) 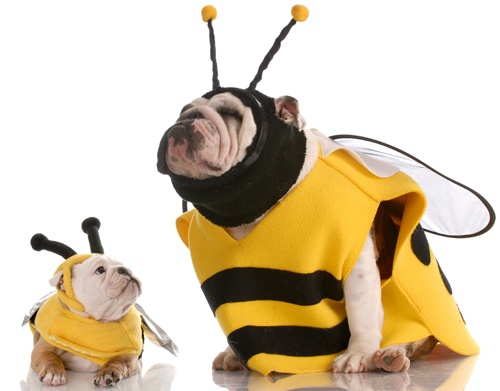 Be sure the costume fits well and is comfortable, and avoid leaving your pet alone in their Halloween finery.Elastic fasteners can constrict blood flow and cause your dog to panic, or try to chew his way out of the costume. A nice photo is a good remembrance. Picture It Here Freestanding Pet Gate is easily customizable. Just insert your favorite photos of your dressed up pets , or even a design that goes with your Halloween décor. The frame fits multiple 6x4 pictures. This wooden gate is freestanding and adjusts to many different widths allowing for easy placement in the home. Dogs thrive on a sense of accomplishment and teaching your dog a new trick is sure to get his tail wagging. There are two effective ways to master-train your way to a cute dog trick. The first is called luring. Hold a treat in the direction you’d like your dog to go. Turn the head and the body will follow. Break up the trick into mini-segments to help your dog succeed. For the classic roll over, lure him into a lying down position first with a tasty treat. Take note if he favors lying on one hip; that’s the direction you’ll want to go to roll him over since his hip is already rolled under his body. Bring the treat to the side so his head is turned away from that hip, and then lure his head up and back toward the rolling direction. If he lies on his side, offer the treat. Remember, you are breaking the trick down into smaller segments. Once your dog is doing this part easily, place the treat right at the end of his nose and slowly arc it around. If he follows it with his head, gently help his body roll and immediately offer the treat along with heaps of praise! The second method is called capturing. Catch your dog doing something cute and assign a word to it. For example, when your dog stretches with his front legs down and forward and rear end up, assign the word ‘bow’ to this action and praise your dog. You can do the same when your dog lies down and flops on his side. During this action, say, “Take a rest” and follow up with praise. Take your time and muster lots of patience, and soon your dog will perform these adorable behaviors on cue. Camping with your dog is a wallet-friendly activity you can both share with equal enjoyment. In fact, your dog’s keen senses will help you notice wildlife you may otherwise miss. Most state parks allow dogs, and some allow leashed dogs on trails too. Check first for policies on dogs so you don’t get shut out. Outfit your dog in a parka or sweater in colder weather and be smart about his suitability for camping. Outdoorsy dogs like huskies, Bernese mountain dogs, American Eskimo dogs, collies and the like will relish a nip in the air while delicate types like the Italian greyhound and the Chihuahua would much rather be home on the sofa than shivering in a tent. Lunch breaks or midday naps at the campsite can be enhanced with a safe and portable confinement system for your dog. 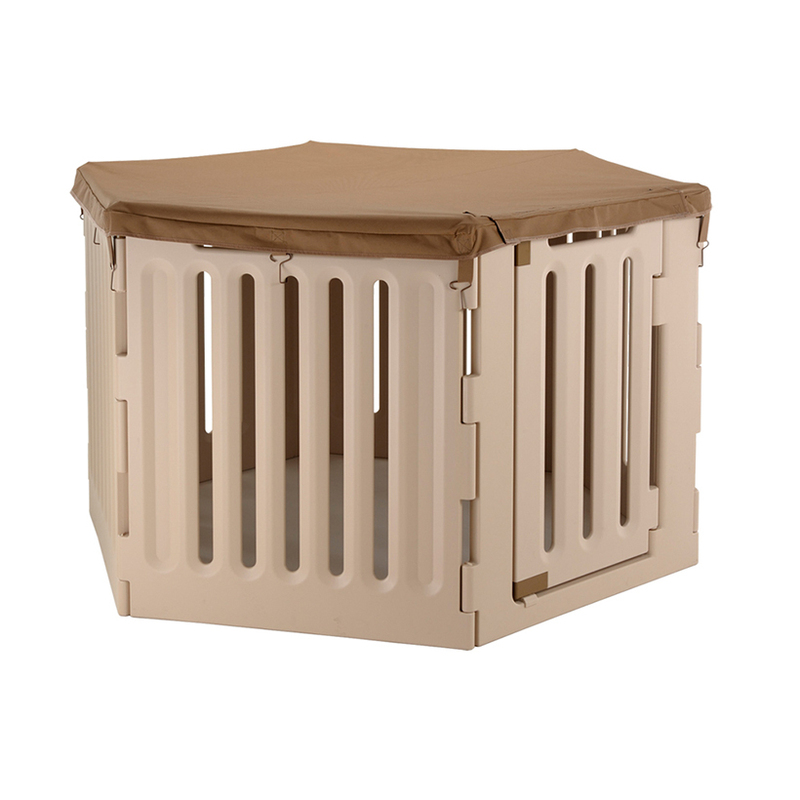 The award-winning Convertible Indoor/Outdoor Playpen keeps your dog secure and the optional vinyl Comfort Mat can be detached and used as flooring to protect him from insects and damp ground. Fall offers a variety of opportunities to share nature’s beauty with your dog. The season goes fast, and soon the pressures of the holidays will make demands on your time. See the season through your dog’s watchful eyes, and open your senses to the possibilities. Your dog can show you the way. 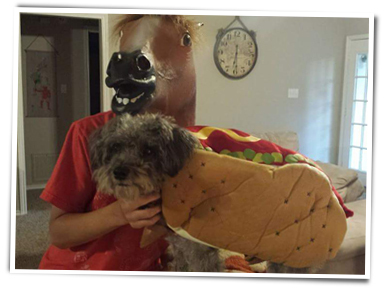 For ideas on how to spoil your dog on Halloween, contact Richell USA today.